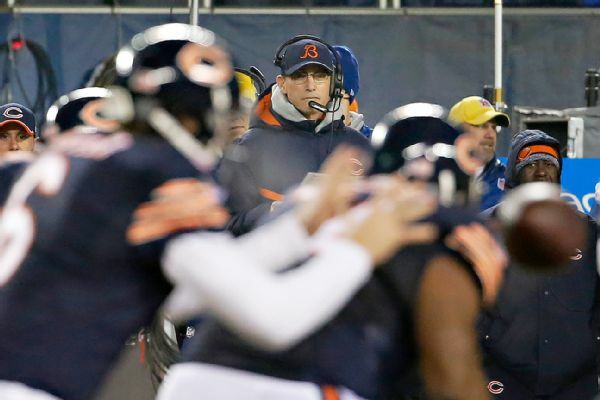 Bears bench Cutler for Clausen, can Trestman save his job? Yesterday, Chicago Bears coach Marc Trestman announced that he would be benching Jay Cutler and starting Jimmy Clausen in this coming Sunday's game against the Detroit Lions. It's about damned time! After Chicago lost to Dallas two weeks ago and were eliminated from the playoffs, I thought the Bears would put Cutler on the bench. When I turned on last Thursday's game against the Saints and saw Cutler step onto the field for the first drive, I stopped watching the game. Is the Bears organization going to look through Cutler and blame only Trestman? What more was there to see in Jay Cutler? How could he not have conclusively proven that he is a bust? Why weren't the Bears taking the opportunity to test out Clausen and / or David Fales for the remainder of this dead season? It seemed so stupid! Heck, if Clausen could win games or spark the offense back to life, it could save Trestman's job. It would be solid evidence that the Bears poor season was mostly on Cutler's shoulders, and not on Trestman's. Again, the Bears looked good last year with Josh McCown playing during Jay Cutler's injury, so Trestman and the Bears have already proven that they can be successful with other quarterbacks. Well, Trestman and Emery finally smartened up and realized that Cutler isn't the guy. But now they only have two games to examine the potential of Clausen, and it seems unlikely that they'll bother with rookie David Fales. If I had been coach, I would have given Clausen one game as starter and given Fales one game as starter, then give the third game to whichever of the two performed better. It would let me know whether Fales is a keeper, or if I should look to the draft for yet another quarterback. The big question will be: can either quarterback successfully run Marc Trestman's west coast-style offense? Jimmy Clausen started against the Lions last Sunday, but still wasn't able to provide a spark of life to Chicago's offense. He didn't do anything special, and he also threw a game-ending interception. He also apparently suffered a concussion. As such, Chicago is back to starting Jay Cutler this coming Sunday in the season-finale against the Vikings. I think Trestman is making a bad decision by starting Cutler. If I were in charge, I'd give the game to rookie David Fales. There is no better crucible for testing a new quarterback than with a meaningless late-season game. Even if he isn't fully prepared, playing him will help the coaches to identify his weaknesses and problem areas against a starting NFL defense in a live game. And if the coaches and management don't see anything redeeming in Fales play, then they will know that he isn't worth keeping on the roster and potentially hurting the team's chances in future seasons if the starter(s) ahead of him go down with injury. Playing Cutler, on the other hand, only risks getting Cutler hurt and destroying any possibility of a trade.